Stemming from the concern that many creative ideas, projects and exhibitions are currently being stifled, dominated, rejected, destroyed or abandoned due to a number of complex forces at work, Foxhole has been initiated to locate a more functioning application of ‘the social’ as it relates to the art world—specifically: the world of an independent curator. Foxhole intends to be a designated space to generate solutions to a seemingly flawed sense of community, renegotiating questionable spheres as they appear to overlap—or do not. If a ‘good’ community and support network for and of independent curators does not currently exist in a specific locale, what steps should be taken to create it, find it or break the cycle of pretense? This project embodies the search for a useful, energetic nexus of ready and willing independent curators; Foxhole aspires to create a less insular yet trusted DIY work zone where both invited and interested independent curators periodically unite with a mutual understanding that their developing ideas will be preserved and cultivated in this safe zone. A Foxhole, by definition (paraphrased), is a shelter, place of refuge or concealment against conflicting forces. This particular Foxhole is designated for independent curators—a constraint which strives to better serve and commit to its targeted individuals. Minibar Artist Space is a non-profit project based exhibition space for contemporary art located in Vasastan, Stockholm, Sweden. 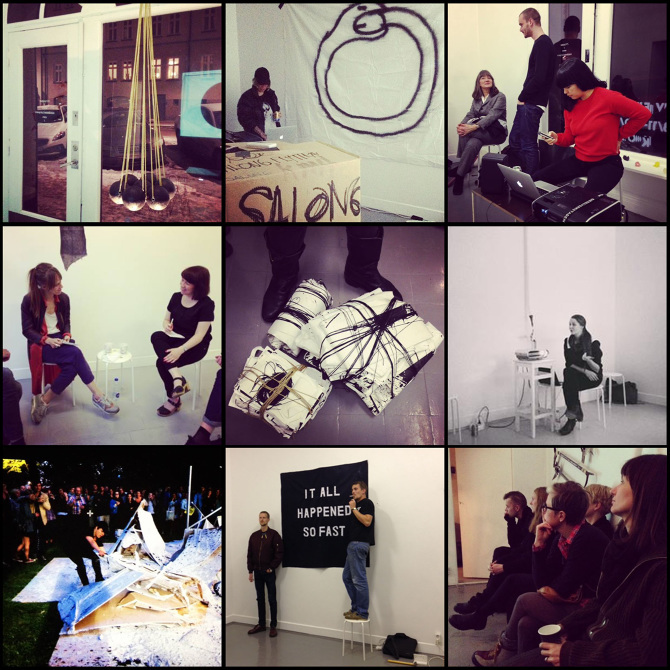 It is run and curated by artists Malin Henningsson, Sofia M. Westin and Anna Sagström. Minibar is created as a platform for presenting short-time exhibitions, collaborations ting short-time exhibitions, collaborations and other art-related projects of and other art-related projects of all media. The short exhibition periods are used as a tool to re-strategize the principle elements of the exhibition format. It opens a sense of spontaneity, complexity and optimism that is at the core of the Minibar philosophy. Regardless of medium, Minibar wishes to occupy the interstices of contemporary art practices with this attitude. Note: Foxhole functions to support smaller groups, therefore meetings and events will be structured accordingly (e.g. more than one Foxhole may simultaneously exist yet at different times, dates or venues). This decision supports the sentiment that participating curators may not reap benefits if there are too many in the Foxhole at any given time. Foxhole promotes a personalized approach to collaboration and hopes to give those in the Foxhole ample time and space to focus. Previous Speakers: Anna Nordström, Mirko Lempert, Ami Kohara, Nicola Bergström Hansen, Ulrika Sparre, Aura Seikkula, Kristoffer Svenberg, Emily Breunig, Angela Mi Young Hur, Adnan Mahmutović, Eskil Loftsson, Jen Lindblad, Carola Grahn, Elina Suoyrjö, Carl-Johan Rosén, Klas Eriksson, Simon Mullan, Linnéa Sjöberg, Isis Marina Graham, Nathalie Fougeras, Anastasia Ax, Jacqueline Hoang Nguyen, Adam Grinovich, Annika Pettersson, Jessika Björhn, Shiva Anoushirvani, Laurie Charles, Carl Palm, Tobias Sjöberg, Franziska Bork Petersen, Jussi Koitela, Sofia Mavroudis, Jacob Dahlgren. valeveil is currently taking submissions for this project. 1. Jean Baudrillard, In the Shadow of the Silent Majorities (New York, NY : Semiotext(e), 1983), 66. 2. Émile Durkheim, The Division of Labor in Society (New York, NY : The Free Press, 1984), 31-175.